Creamy, cheesy, and crunchy – oh my! Southern folks know you can’t go wrong with a classic hashbrown casserole. They’re perfect for church potlucks, family reunions, funerals, and everything in between. This potato-packed dish is sure to leave you satisfied. These make-ahead mashed potatoes are the perfect side dish to a hearty Southern dinner. The buttery, textured dish will surely keep you coming back for more. This filling 13x9 recipe is a savory casserole packed with chunks of pineapple that are sure to make you feel nostalgic. Be sure to give the classic dish a try. It’s a modern twist on a beloved old-school recipe! Tuna casserole is tasty and nutritious. This recipe is a win-win for the entire family. You can never have too many potato dishes on the dinner table. This scrumptious recipe pairs beautifully with a variety of Southern cuisine. 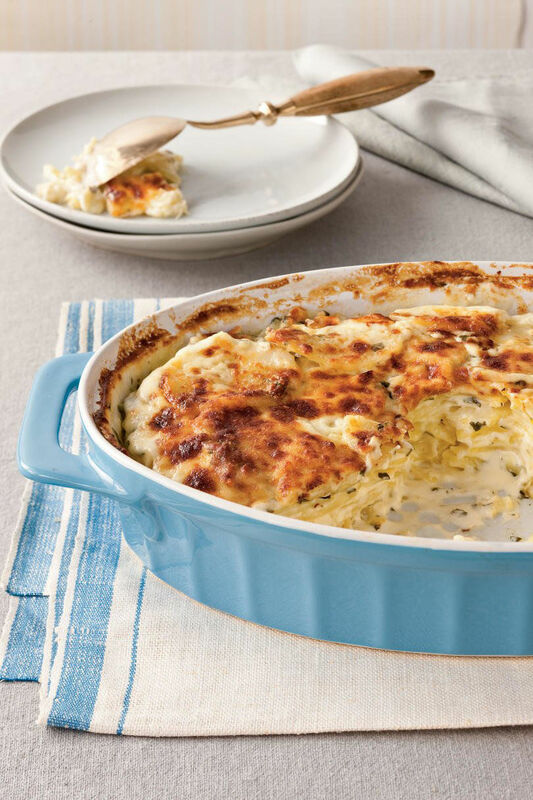 Classic parmesan scalloped potatoes are perfect for a relaxed Sunday evening dinner. It’s a little spicy, a little sweet, and a whole lot of delicious. Savory corn pudding is a classic Southern recipe that’s always bursting with flavor. Pop the ingredients into your 13x9 dish, and you’ll have the perfect side dish in no time. Casserole lovers, rejoice! This reunion pea casserole is perfect for feeding a large crowd at Sunday night dinner. Your family will thank you for this one. The secret to this impeccable dish: cubes of Cheddar cheese that melt as the pasta cooks, creating pockets of pure cheesy perfection in every bite. Old-school green bean casserole is sure to keep things traditional at your Sunday night dinner. The French fried onion topping really takes this recipe to the next level. This Southern staple never fails at Sunday dinner. With chicken, cheese, and pasta – what’s not to love? Don’t forget the dash of hot sauce! It’s never a bad time for a vintage recipe. This green bean casserole is definitely a twist from the one your grandma use to make, but we think she’d welcome the change. With large chunks of bacon, roasted Brussels sprouts, and chestnuts, this dish is a star. The recipe title may sound funny, but you won’t be laughing after the first bite! With only 30 minutes of time in the kitchen, baked shells and greens is the perfect no-fuss dish for a Sunday dinner. Baked smokin’ macaroni and cheese is the comforting dish your dinner needs. This delectably smoky recipe is jam-packed with fresh Gouda and Cheddar cheese, corkscrew pasta, and smoked ham. Y’all know we can’t turn down a biscuit – especially when it’s paired with creamy chicken pot pie! This 13x9 version is sure to make your taste buds tingle. This delightful recipe is an Italian-Southern pairing, and it couldn’t be tastier. Throw the fresh ingredients into a 13x9 pan, and watch as your Sunday dinner gets the ultimate upgrade. It’s even better than it sounds- trust us! With egg noodles, fresh turkey, and a heaping helping of cream sauce, this dish is a surefire winner. Who wouldn’t appreciate a pop of color on the dinner table? This recipe pulls at every Southerner’s heartstrings. It’s as classic as they come. This ultra-easy Lone Star State casserole is all things comforting and delicious. With velvety layers of chicken, green chilies, and corn tortillas – this dish will bring a little spice to your Sunday dinner. Spinach, mushrooms, and creamy garlic-and-herb cheese star in this turkey tetrazzini. Looking for the perfect side? Throw some garlic bread in the oven, and you’re good to go!